I have tried so many self tanners out there and I've only found a couple that actually work well with my skin! 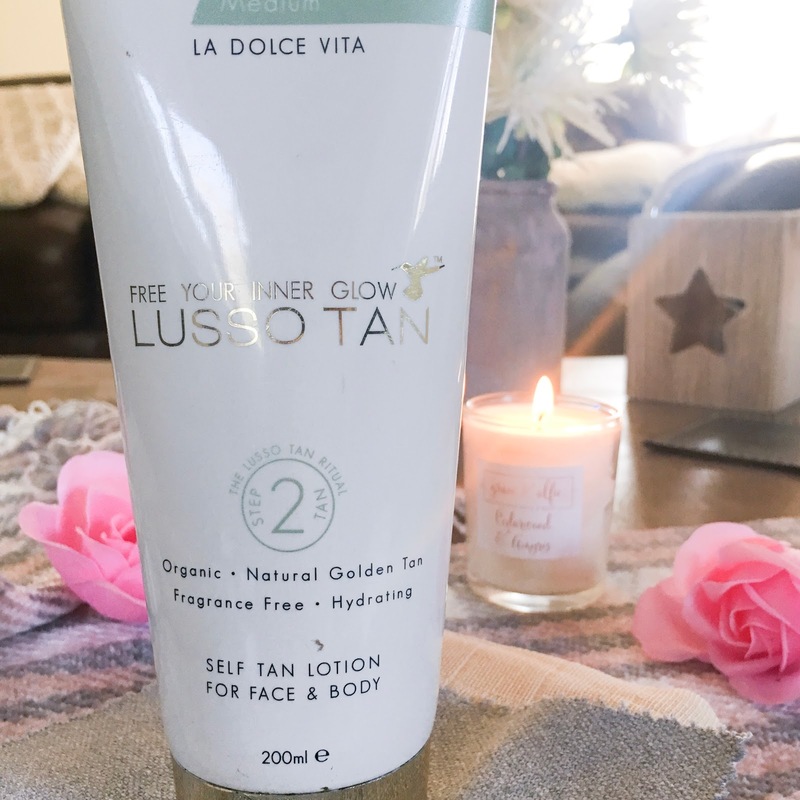 Lusso Tan was a tanning brand that I had never heard of before so when I had the chance to review their product, I was over the moon! Now, I know you're probably thinking... another item that has been sent to you, great... but I can truthfully say that I have never tried a tan as good as this one before! Smell - First of all, there is absolutely no smell whatsoever! Most tans seem to have a sort of 'biscuit-y' smell to it, but this one doesn't! This is one step closer to achieving a realistic tan! Quality - It looks so natural, it has a sort of olive tone to it so it matches perfectly to my skin! It doesn't cling to dry patches and doesn't leave streaks. Drying time - It does dry quite quickly so you have to make sure you rub it in straight away but I did find that I was able to rub it in in time so that I didn't get any streaks. I do find that it is great if you are in a rush because it dries completely in under 60 seconds. Price - It is sold for £19.50 on the Lusso Tan website which may be expensive to some but when you compare it to tanning brands such as Bondi Sands then you realise that it is actually a pretty decent price after all. Other - Another great thing about Lesson Tan is that it contains organic ingredients which as you know, I do prefer organic brands so it was great for me! Overall, I really love this tan and I can't imagine ever living without it! Whats your favourite tanning brand? Let me know! I have never seen this tan before! i love that you said it looks natural, can't be dealing with people looking too tanned and you can tell it is fake haha! I've never heard of this tan before, may be one that I have to try out!! I definetly need to try this! Thanks for the recommendation! Oh fab recommendation - I will be sure to check this out, I'm going to need to top up my tan ASAP, especially as it dries within 60 seconds - perfect for someone as beauty-clumsy as I am! I never use fake tan but this sounds like a great product. I haven't heard of them before either. I've never used a product like this before. A tan without a smell is something I am always on the hunt for! I'd love to try this! Oh Ive not heard of this brand before. I do like to use a winter tan in the colder months for a little colour. I shall bookmark this so I didn't forget the brand. Thanks for sharing. I’ve never heard of this brand before! Some fake tans i’ve tried the smell is horrendous so loving the idea that this one is odourless! I've been looking for a great self tanner. The problem I run into is finding one that smells good and doesn't leave streaks. This looks like a perfect fit! I've never seen this brand before! Looks great though... I'm definitely considering giving it a go! !